Honey bees contribute directly to sustainable local food production and more broadly, through pollination, to crop production. They are susceptible to pests and diseases, which have increased significantly in the UK over the last 5 to 10 years. Current widespread risks include American Foulbrood and European Foulbrood, varroa mites and associated viruses. Colony losses due to varroa infestation have increased since 2001. This is a result of the mites’ developing resistance to available pyrethroid varroacides and the limited alternative treatments. Potential exotic risks include the small hive beetle, parasitic brood mites (Tropilaelaps species) and undesirable species such as the Asian hornet. The management of pests and diseases in hives to the lowest levels achievable, in particular through integrated pest management, is needed in order to reduce the risk of further spread to nearby apiaries. It is also necessary to sustain the role of honey bees in pollinating crops and to minimise lost honey production. The health of bees is concerned with anything that potentially harms honey bees, including bacteria, viruses, arachnids (e.g. mites), insects, fungi and other pathogens, which cause disease or feed on bees, as well as adverse effects caused by other threats, such as undesirable species that prey on colonies, the misuse of pesticides and the impact of climate change. The aim of these pages is to signpost where beekeepers (or those interested in becoming beekeepers who want to know a bit more on what is involved in keeping bees) can find information about bee pests and diseases. BeeBase is the Animal and Plant Health Agency’s (APHA) National Bee Unit website. It is designed for beekeepers and supports Defra, Welsh Government and Scotland’s Bee Health Programmes and the Healthy Bees Plan, which set out to protect and sustain our valuable national bee stocks. By registering your bees on BeeBase, Defra is able to give you guidance on bee diseases in your area. In addition, their inspectors undertake statutory inspections for notifiable diseases (currently American and European Foulbrood, Small Hive Beetle and Tropilaelaps mites). Registering your hives and apiaries in BeeBase is strongly recommended for all members of OBKA. 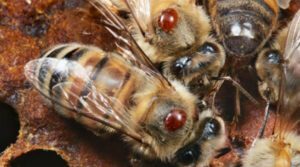 BeeBase How to spot American Foul Brood (AFB)? BeeBase How to spot European Foul Brood (EFB)? The following UK Government leaflet gives advice of specific aspects of bee health that is covered by statute, including the notifiable diseases and import and export of bees. Asian Hornet: Management of the Asian Hornet threat is covered by Invasive Species legalisation while the four bee diseases are managed under specific bee disease legalisation. As a result, the reporting and management of the Asian Hornet threat differs from that of the four notifiable bee diseases and is covered on our page on Asian Hornet. If you believe that you have a notifiable disease you should immediately contact your Regional Bee Inspector. The one that covers you area can be found on BeeBase here.